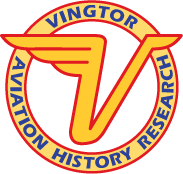 Vingtor Decals can be purchased directly from Vingtor Aviation History Research. Send an E-mail to vingtor@vingtor.net with your ordering details, including your address. We will confirm availability and total price soonest possible. For Norwegian customers, payment to bank giro account 2085.63.66473 is preferred, or by Vipps to 954 35 177. Foreign orders can be payed by PayPal, using vingtor@vingtor.net as reference. Please send a message when payment is completed. Decals are dispatched when payment has been received, within a few days. We ship once a week (usually on Fridays), or sooner. Postage : For shipment, postage is added according to the following rates (in NOK). The postage rates are calculated from an average. The actual postage might vary slightly. Note 1: Do not transfer any money before your order has been confirmed - decals may be out of stock before the web site is updated. Note 2: During periods of Chrismas, Easter and summer vacation (typically July), we cannot guarantee order confirmation and shipments within the normal few days. We will reply and ship orders as soon as possible. Note 3: We have mixed experiences with postal deliveries to the USA. Usually this takes about a week. However it has occurred that shipment has taken several weeks (even by air mail), and on one occation (long time ago) not delivered at all.